This is a complete Hanging Door Rolling Hardware Kit containing pre-drilled Flat Track and all other components needed for a single door installation. Kit components are made from distressed hammered iron. 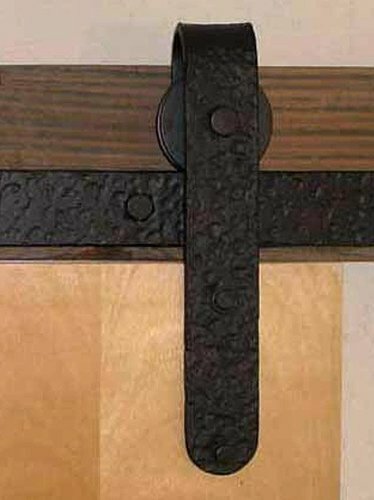 The Door Hangers have rounded cutoffs at the bottom of the Hanger for a slightly more rustic look.Track Set Includes. 1ea. Distressed 72 in. 1829 mm steel flat track with 5 mounting holes at 1in. from ends and 17-12 in.apart.. 1pr. Basic wheel and hanger assembly with fasteners.. 6ea. Wall stand-offs with mounting lag screws.. 1pr. Anti-jump blocks with mounting screws.. 2ea. End stops with foam bumpers.. 2ea. Door bottom stabilizer with anchorsmounting screws.Features. Dimension - 72 L x 12 H in.. Size - 3 in.. Product FinishColor - Flat Black.. The length of the track selected is usually twice the width of the doors or greater.. For double door biparting door applications two kits and an RH803 Track Splicer are generally required. (1pr.) Basic wheel and hanger assembly with fasteners. (6ea.) Wall stand-offs with mounting lag screws. (1pr.) Anti-jump blocks with mounting screws. (2ea.) End stops with foam bumpers.